Can you believe it’s October already? That means I have only a month and a half left in London! Or it would have… I’ve decided to postpone my return to Dallas until the first week of December. I just feel like I need more time! Since I’m already over here, I figure I should get as much out of it as I can – that means more time in London and booking a few more trips. With that said, it’s already rather chilly over here and I’ve been layering up practically every day! I assume it’s still relatively warm back in the US, but you should definitely be prepared for the temps to drop by the end of October. In Dallas I can always count on October 31st to be the start of actual fall weather – anyone else have that same experience on Halloween? It always gets cold that night! 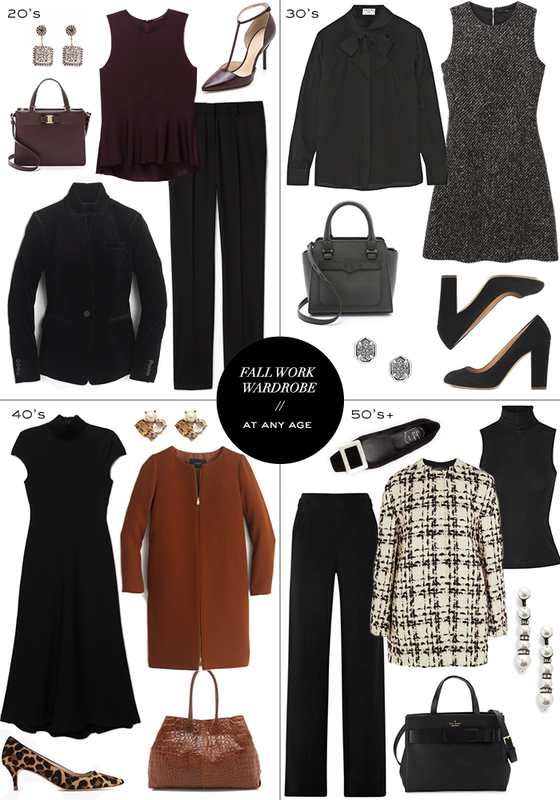 In getting your work wardrobe ready for fall, there are a few key versatile pieces I suggest you add to your closet so you don’t have to buy completely new ensembles. 1. A bow-neck blouse (also love this ivory one!). I find these tops to be incredibly wearable – wearing them with pants or skirts is an obvious choice (and certainly easy), but try layering it under your favorite sleeveless fall shift (love this one from Theory!). It’ll be lighter and less stuffy than wearing a blazer, but still work appropriate. 2. A pair of t-strap pumps or Mary Jane’s will update your office look for fall with current trends in mind. A few I’m coveting include this burgundy Phillip Lim pair, these pumps by SJP, and these Tabitha Simmons Mary Jane’s. 3.A sleek, no frills coat. Trenches are always great, but when the temps really start to dip you’ll want a topper with a little more substance. This coat from J.Crew is simple, understated and chic – the ideal piece for the office! I love all of these but the oxblood top in that first outfit is especially gorgeous! These are all such gorgeous outfits! Your style is impeccable! LOVE this! Love the bow accent on that Frame Le Bow Silk Blouse. Always a sucker for anything with a bow! I love all of these classic and feminine pieces! Hope you are enjoying London, Merritt! That coat is beautiful. I love it so much.